Roadies out there will agree with me that nothing beats the thrill of living life on the fast track. Nothing is more beautiful than a thousand sunsets in a thousand different towns. Some people are born into this culture, and some want to start on the journey today. 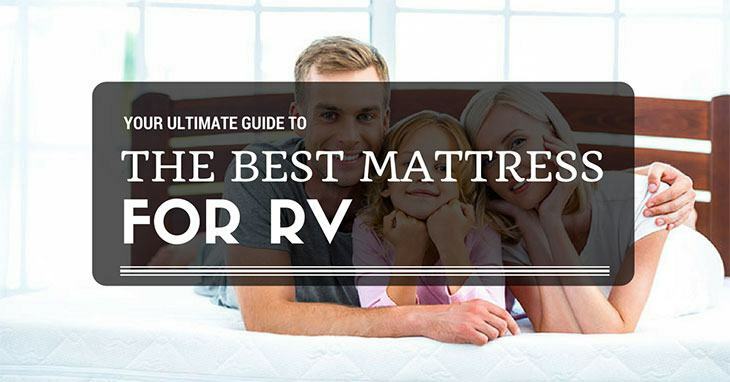 That is why today we are talking about the best mattress for RVs. Whether you are just thinking of buying an RV (recreational vehicle) or want a serious upgrade to the factory mattress that came with your motorhome, you need to research more on the subject. At the end of the day, a good night sleep is what makes a great start to the day. This mattress comes with a 3-inch thick memory foam, 2-inches of pressure-relieving foam and 5 inches of high-density support foam. 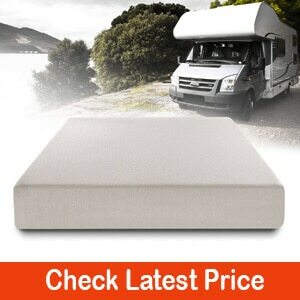 These comfortable layers make the mattress a preferred option by many RV enthusiasts.The foam used is CertiPUR-US certified therefore you get assured of high durability and performance. The memory foam gets made from plant oil, and therefore it is healthier than the ones made from traditional fossil fuels. It is very breathable and will adapt well to the contours of your body for the best sleep. The mattress is also easy to compress and transport to the customers. What is great about this mattress from Dynasty Mattress is the level of detail put in the cover. The cover houses a 3-inch memory foam, dual 2-inch pressure relief foam (with cool Airflow technology) as well as a 5-inch support foam. Looking closer at the cover, it has a high-quality top together with suede details at the corners. It has a zipper. Therefore, you can take it out and wash it anytime. You can get the mattress in six different sizes which are Twin, Twin XL, Full, Queen, Queen RV and California King. For the Queen RV model, you get it with two gel foam pillows for free. These pillows match the color of the mattress cover itself. Some customers also found the mattress to be too firm. Ideally, after a couple of weeks of usage, the mattress should ease up. This mattress is appealing for those who do not have a preference for memory foam mattress. It contains heavy gauge steel coils which help in relieving pressure and isolating movement on the bed. The different layers of the mattress are covered in a fire-retardant barrier for safety purposes. Even with a small 6 inches of thickness, you will feel good sleeping on this mattress. Additionally, it comes compressed for easy carrying. For RV fans, this is always a handy feature. The lightness makes it ideal for driving around with it without much hassle. Some have also pointed out that some mattresses come in the wrong dimensions. Use this mattress as a topper for you are uncomfortable with the one that is in your RV. You should opt for it if your current mattress is sagging or has developed a soft spot where you sleep. You will immediately notice the difference in comfort once you use it. This mattress is inexpensive, and anyone can buy it to improve their lives. The foam provided by this company is PURGreen certified and is safe for you to use. It has also been made using safe chemicals. The foam also features a 33-pound compression which means it can provide excellent support for people with back pain as well. You can get it in five sizes which are Twin Extra Long, Full, Queen, King and California King. Sometimes the foam can slide about on the bed. 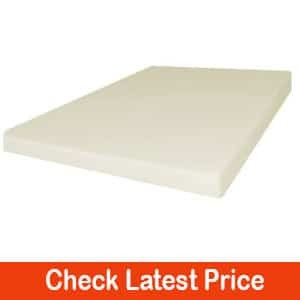 This memory foam mattress is a great bargain for those who need a decent upgrade at a competitive price. 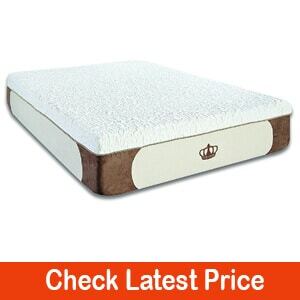 The great thing is that the memory foam used offered great contouring to your body so that you can sleep comfortably. The foam is CertiPUR-US certified which means that it was made using safe chemicals. It comes in 3 layers, the first is 1-inch memory foam; the second is a 2-inch soft, breathable foam and the third is a 3-inch support foam. The result is a mattress that will keep your spine aligned through the night. The size options available for this 6-inch mattress are Queen, Full, and Twin. An RV mattress is found in motorhomes or recreational vehicles. They vary in sizes depending on the size of the car you have. Usually, they are smaller than your standard bedroom mattress. Many recreational vehicles (RV) will come with a rather hard and uncomfortable mattress set. It is important for you to find the right mattress because it will be the difference between having a good sleep and waking up feeling sore. Measure the distance between one side (on the inside) of the bed space to the other inner side. This is the distance from the resting areas of the mattress to the highest point (vertically) that you want the mattress to reach. Please note that mattresses for your RV will be shorter than the standard bed mattresses, around six inches shorter. This difference means that you should also consider the kind of sheets you buy for the RV mattress. You may notice, or you may have an RV with a curved bed frame or maybe have corners that have been cut up to make access to the bathroom. These bed frames will need you to have the mattress shaped to fit. There are a few options for those who need to either buy or upgrade the current mattress. By far, the most popular mattress material is memory foam. The reason why memory foam is loved so much is that it adapts well to the contours of your body. It is also breathable and will reduce pressure points. Those who might not afford whole foam mattresses might opt for foam toppers. These toppers are an inexpensive option and an excellent addition to the mattresses that come with these RVs. When it comes to bed frames which fold up in RVs, it is important to have the right measurement. Getting a thick topper means your sofa bed will not fit properly. This is not so great because, over time, your frame might lose its integrity. For pop-up camper beds, it is advisable to use a topper because of the thickness of the mattress. One challenge you might face is when collapsing the bed and pushing it back in. If you have a thick topper, the pop-up bed might not fit in properly. If you happen to be picky with the choice of toppers, there are two recommendations; try memory foam or eggshell toppers. Compare to memory foam; eggshell toppers are generally less thick and cheaper. They will also not make the bed too thick to fit back in its position. This is the traditional and most common type of mattress. These have few layers, for instance, a support foam and a memory foam. The layers are breathable and can help prevent your body from running hot while you sleep. The interesting thing about air mattresses is that they perform extremely well in camper vans and RVs. They have a soft foam top layer. The downside to using air mattresses is the cost involved. A great addition to air mattresses is that you can adjust the firmness on each side of the bed simply by controlling the amount of air on each side. You can easily deflate and store the mattress which means you will have enough space for other things. This can be perfect if you have unexpected visitors. These innerspring mattresses provide much comfort. However, they are quite bulky. These mattresses can attract considerable condensation when the weather changes. Many RVs use platform beds, and it is likely that the moisture that accumulates might lead mold formation. In the end, you might be exposed to many health risks because of the mold. However, if you have to look for such a mattress, you should find one that is made using high-quality materials. Ensure it has durable springs which will not become less bouncy quickly. Another alternative can be a pillow top spring bed because they come with an extra layer of cushioning. 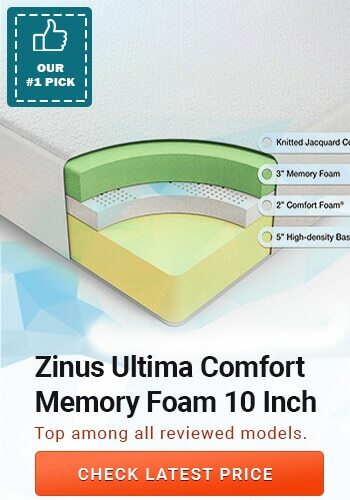 Our best pick for this review has to be the Zinus Sleep Master Ultima Comfort Memory Foam. 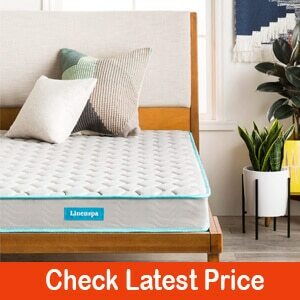 This particular mattress has great value for the money you spend on it. The memory foam gets made from safe and environmentally friendly materials which are harmless on your skin. We particularly loved the 10-year warranty that comes with each mattress as well as the rapid expansion of the mattress without any odors. We hope you have a pretty good idea of the best mattress for RV after going through our review. Finally, it is important to ensure the mattress you buy for your RV has the proper fit and will survive the different areas you will be traveling to. Storage and care for the mattress are important factors which determine how long your mattress lasts. Which mattress are you currently using in your RV and how is it holding up? Drop us a comment or question, and we will be glad to talk to you. See you in the next one!